I asked you to RSVP so that DFW could figure out the best location to hold the event and we’ve had just about 200 of you say you’re coming. That is a lot, so it means there was only one good spot to do this… Founders’ Plaza. For those who don’t know, Founders’ Plaza is an excellent spotting area on the north end of the western runway complex. We should all hope for clear skies and arrivals to the south, but don’t worry. We have a backup plan if the weather is horrible. Just keep your eyes on the blog or RSVP to receive updates. If you have any questions, let me know. Or if you’d like to contribute a raffle item, then I’m all ears. 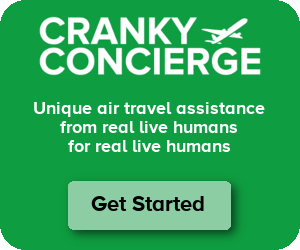 It’s cf@crankyflier.com.